We offer a full cushion interior refurbishment service. Most manufacturers today fill their cushions with blown fibre/hollowfibre. This looks fine in the showroom and is comfortable for a while once you get your furniture home but can soon start to look unsightly and feel uncomfortable as it compresses and goes lumpy and bumpy. It can also lead to premature fabric wear on your cushions as the hollow fibre allows the fabric to crease more and as you sit on those creases they can noticeably wear. What we offer is the best quality foam replacements. Unlike other fillings our quality foam retains its shape, putting an end to the continual and irritating practice of “puffing up”. To finish off your foam cushions we use a Dacron polyfibre wrap with a stockinette finish for seat and replacement sofa cushions. Dacron rounds off the corner edges, filling the cushions out and taking out any bagginess in the fabric. The Dacron wrap and netted finish gives your foam cushions increased protection and durability, whilst also making the foams easier to slip in and out of covers. The end result is a professional finish combined with the quality and comfort you deserve. All you need to do is bring us the cushions and we will measure them and advise you on the best foam for your requirements. We then order in the foam and fit them to your cushions. From order to filling your cushions can be as little as five working days. 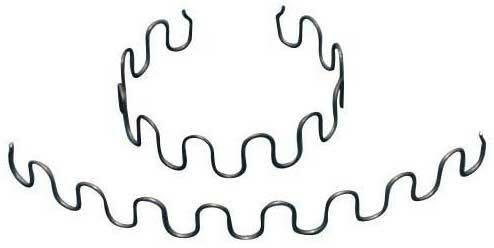 We carry out furniture repairs such as re-webbing and zig zag spring replacement. Some repairs we will even do in your own home. Frame repairs etc can also be carried out. We can carry out a report for your insurance company or manufacturer guarantee. There is a charge for this service but it can normally be claimed back from your insurance company and will substantially help with your claim. We supply upholstery fabric and other items such as studs, tacks, webbing, braid etc for your own projects. We have a large range of fabric and vinyl offcuts in stock and if there is nothing in stock we can order any fabric in for you from our huge range of pattern books. We can supply a wide range of foam cut to the size you require. From 1/2" thick to 8" thick in a wide range of qualities, including Reflex 500, to suit many purposes for a simple cushion pad to a window seat to a mattress for a caravan the requests we get are wide and varied. Simply let us know your measurements in inches and the purpose your require it for and we can advise you on the best solution and work out a price. We can cut to your own template. Some foam is carried in stock other foam may have to be ordered. All foam cut to size must be paid for at point of ordering.